If you haven’t been following debates on biofuels recently, you’ve been missing a lot of excitement. Fortunately, a timely new CGD Working Paper by my colleague Kim Elliott provides a primer for how to think about these debates through the lens of development. The bottom line is that biofuel subsidies in rich countries are bad for development by increasing the costs of food and driving tropical deforestation even while failing to reduce the emissions that cause climate change. In addition, they set a bad example for developing countries to follow, a trap Indonesia is poised to fall into. More on these below. But first, a quick summary of legislative developments in February. Here in Washington, bipartisan legislation that would limit the mandate to blend corn-based ethanol into gasoline was introduced into both the House and the Senate. While such reform legislation has failed in the past, some observers think 2015 could be the year that a successful coalition comes together. Meanwhile, across the Atlantic, the European Parliament’s Environment Committee voted to reduce the cap on biofuels made from food crops down to 6 percent. This would limit the use of such biofuels to meet the EU Directive on Renewable Energy, which requires that 10 percent of transport fuels be based on renewable energy by 2020. What do US and EU biofuel policies have to do with development? Biofuel subsidies are understandably opposed by Big Oil and budget cutters. But in a case of “strange bedfellows”, advocates for reform of US and EU policies also include groups that lobby on aid policy and tropical forest protection. The new CGD Working Paper by Kim Elliott explains why. Biofuel mandates and subsidies were put into place in the US and the EU as a way of providing support to farmers facing low prices for their crops. (Justifications related to climate benefits were added later.) These policies have been successful in meeting their original purpose of increasing demand: the US mandate for corn-based ethanol and the EU demand for biodiesel based on oil seed feedstocks were largely responsible for a five-fold increase in global consumption of biofuels in the 2000s. 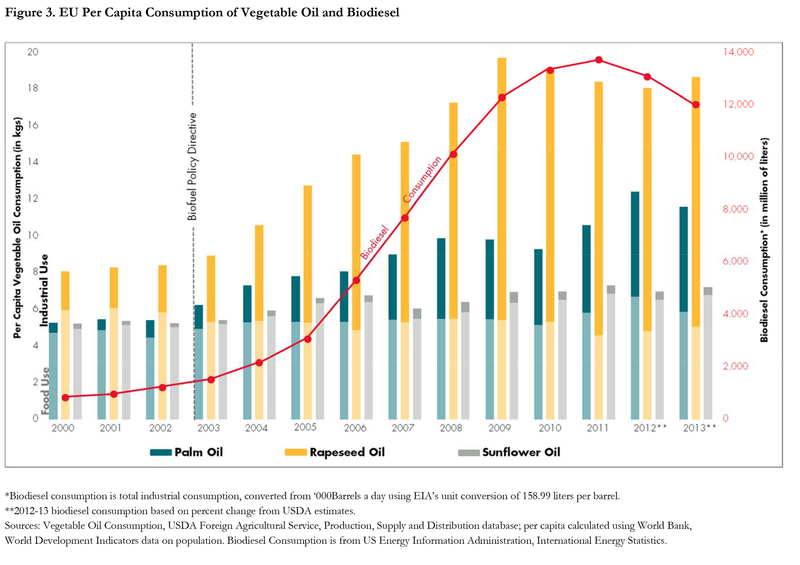 The problem is that expansion of palm oil plantations has been identified as a key driver of tropical deforestation, which in turn is a significant source of greenhouse gas emissions. As a result, in contrast to the stated objective of helping achieve emissions reduction targets, biofuel mandates can actually increase total emissions compared to the fossil fuels they are designed to replace. The “carbon debt” incurred when a carbon-rich peatland in Indonesia is converted to an oil palm plantation to produce biodiesel can take centuries to repay. An increasing number of developing countries have been following the example of rich countries, and putting into place their own subsidies and mandates. Elliott’s paper reports that the number of countries that have established mandates to blend biofuels with gasoline or diesel, tax incentives, or indicative targets, rose from just 10 countries in 2005 to more than 60 by 2013. Even while many of these countries are not yet meeting new targets for biofuel production and consumption, they are likely succeeding in creating vested interests in maintaining these policies at the expense of the world’s forests and climate, as well as more worthy claims on limited domestic fiscal resources. I find the recent news on this front from Indonesia particularly disheartening. Early in his new administration, President Joko Widodo took advantage of low oil prices to remove the fossil fuel subsidy that had constrained the country’s fiscal space during much of his predecessor’s tenure. But now, the new Indonesian Minister of Energy has proposed that part of the savings be used to triple the subsidy for biofuels as a way of propping up sagging prices for palm oil. Such a move has been greeted with alarm by environmental groups, who predict that it would accelerate deforestation through land conversion to produce more palm oil for biodiesel and sugarcane for ethanol. Higher prices for such commodities without stronger forest protection would be a further blow to Indonesia’s struggle to address the country’s high rate of deforestation and associated greenhouse gas emissions. As described in a recent CGD Policy Paper, the policies and institutions that Indonesia has put into place to reduce forest-based emissions are fragile, and the Jokowi administration has already dismantled the world’s first agency dedicated to that objective. It’s ironic that just when rich countries are taking steps to roll back biofuel subsidies, Indonesia is poised to roll them out. [i] The WRI paper – especially the claim that the climate benefits of bioenergy have been overstated by “double counting” -- has been met by a fusillade of attacks from the biofuels industry and rebuttals by other scientists. But a more technical academic review of biofuels accounting by John DeCicco of the University of Michigan raises many of the same concerns about accounting for the climate benefits of biofuels as the WRI paper. As an engineering student almost 30 years ago, DeCicco was the smartest guy in my grad school economics classes at Princeton, so my inclination is to take his word for it that there’s a problem.